Health benefits of lemon vs lime? QUESTION: I ran out of lemons. Can I use limes? Yes, you can. I have compared the nutritional benefits of lemons and limes and they do not differ all that much. I think it really comes down to personal taste preference and experience. What are some of the similarities of lemons and limes? Both are excellent sources of vitamin C and vitamin A, folic acid, flavonoids, antioxidants and potassium. 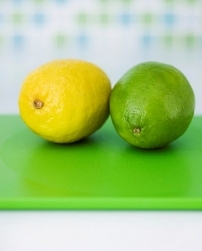 Both lemons and limes contain many flavonoid compounds that have anti-cancer properties. Both contain compounds called limonoids, potent anti-carcinogens that are believed to help prevent the spread of cancer, according to scientists from the U.S. Agricultural Research Service. Both lemons and limes have an alkalizing effect in the body to help neutralize excess acid wastes that cause cellular damage and inflammation. Both have amazing qualities that are similar to our digestive juices. Thus, they are both effective for optimal digestion and elimination. Both have anti-bacterial and anti-viral properties. For example, the anti-viral properties of both the lemon and the lime can help fight cold, flu and even cholera infections. Both are potent detoxifiers in the body, cleansing the blood, the liver, and all bodily tissues. What are some of the differences of lemons and limes? Lemons are scientifically known as Citrus limon and limes are Citrus aurantifolia. In summary, lemons and limes appear to be quite similar nutritionally, with lemon water having a slight edge in benefits. In addition, according to Jethro Kloss, author of the timeless book Back to Eden, “Lemon juice is similar in atomic structure to saliva, hydrochloric acid, bile and the stomach’s other digestive juices.” Lime juice is not quite the same as lemon juice, but still beneficial. I have tried drinking both lemon water and lime water, and I much prefer lemon water for the taste and the superior digestive benefits I get with lemon water. However, as with all foods, what works best for one person may not be the best for another. Bottom line, drinking lemon water or lime water will provide numerous nutritional and health benefits.